‘Red Mud’ Colored Water Out of Faucets During Flushing… A Problem? As I get older I get more concerned with environmental and or products for consumers that could be misleading information and not true. Sad enough but you almost have to confirm your own facts to be clear these days. As we would hope that we could work in the interests of each other for a healthier and safer environment, I find that’s not true always true so I have come to the conclusion just be SMART. My story ~ I know that throughout the years in my small town there has been a lot of fuss and the city water system has changed hands from the now county that runs through entirely different hands just within the last few years. My water (City)coming through is red mud color for a short period of time through our faucets. It seems they do send a flyer out to citizens right before this actually takes place. When I’ve called to report this they say they are flushing the systems and not to drink water for a few days. Do I need to worry? I’m sure they are doing their job but should I be alarmed? I just would like to check my own water levels for any contaminants and make sure before I use the water filter pitcher or water filtering system on my kitchen faucet to make sure if I need to use one. How can I check my own water Or purchase a kit for my own peace of mind? Thanks, Cathy H.
Thank you, Cathy, for contacting us and we feel quite certain that many other folks find themselves in similar situations and would like answers to questions like you mentioned. Most areas we have encountered perform flushing of the lines — a necessary ritual usually performed to keep deposits of sediment, etc. from building up in slow-moving water lines — once or twice a year and yes, most municipalities do advise residents not to drink the water during the event(s). We have not, however, heard of a water district telling residents to not use their water for a period of several days. Usually we have seen water departments and water companies specify a window of several hours when they will flush lines and advise residents to run water after the flushing gets completed until it turns clear… and then for a little while longer after that. We suppose that the age of the water system and how long it takes to purge itself of the unwanted (red mud in your case) sediment would affect the amount of time residents would want to avoid using the water, but you would need to discuss specifics like that with your municipal water company. What IS That Red Stuff Anyway? Without actual water test results in hand we would guess that you see dissolved and non-dissolved iron sediment coming out of your faucets since the flushing of water lines does tend to stir that stuff up and push it out. 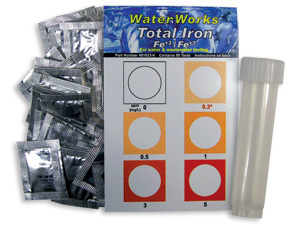 For that reason we believe you may want to test for iron (total iron) once the water returns to its normal clear color and we have found that the WaterWorks Total Iron Test Kit works quite well for that purpose. The fact that you no longer see color in the water does not necessarily mean the water no longer contains metallic or other contaminants. Determining the Need for a Water Filter? Tricky business, but no impossible. 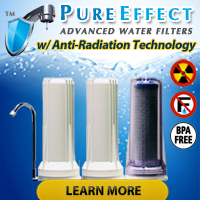 We suggest using third party, independent laboratories like National Testing Laboratories that have no interest in selling you a water filter after handing over the test results. Local water testing labs often have an edge, though, since their staff have tested water in a particular region many times and can draw off that experience to perhaps shed a little local light on the reasons for and causes of water quality issues. A quick check of the phone book should turn up a few good choices for local labs but we suggest contacting the local health department and asking them for a list of accredited water testing labs in an area. 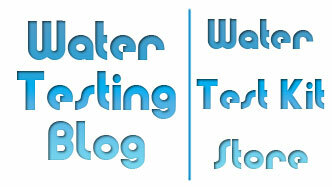 Drinking Water Test Kits for Home Use? We offer a good number of drinking water test kits for home use in the Water Test Kit Store on this site and from what you described it sounds like you may want to consider using a general test for metals on a semi-regular basis that will detect drinking water contaminants such as iron, copper, lead, manganese, cobalt, etc. Other kits such as the COMPLETE and Water Quality Test Kit may also come in handy… but no matter which kit you select, none will ever take the place of having a fresh set of analytical, independent eyes from an accredited water testing laboratory examine the quality of your water.